​In Hidalgo County, Texas, a few minutes drive north of Reynosa, Mexico, and 250 miles south of San Antonio lies McAllen, a city whose major development occurred in the latter half of the 20th century. Today McAllen is a growing business center with over 100,000 residents. Jews began arriving in McAllen’s surrounding area in the 1910s though a significant Jewish population did not arrive until the 1920s and 1930s. 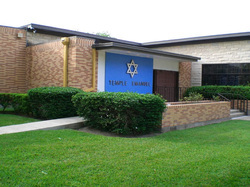 Seeking Jewish organizations and a spiritual community in their adopted hometown, a temple was founded in McAllen shortly after the establishment of the State of Israel. Unlike many other Texas Jewish communities, where numbers have dwindled significantly over the years, McAllen’s congregation, Temple Emanuel, remains strong today. Jews were among the earliest settlers in McAllen and its surrounding towns. Sam Greenfield, who had left Russia to avoid conscription, arrived in Mission, six miles from McAllen, in 1913. Starting with just a small shack, Greenfield’s clothing business flourished as he become a retail and wholesale dry goods merchant. His children, who had lived with his mother in Baltimore since Greenfield’s wife’s death in 1912, began arriving in McAllen in the mid-1920s. Isadore Moritz, a newspaperman from San Antonio, arrived in the Rio Grande Valley around 1906 and moved to Mercedes in 1908. He married Julia Bullock in 1913 and moved to McAllen two years later where he purchased the local newspaper the Monitor. The Moritz family later moved to Raymondville in 1924 and then Harlingen in the 1930s. Iowa-native Percy Herman arrived in McAllen with his family by 1920 and opened a successful dry goods store. In 1916, McAllen’s economy was bolstered by the presence of 20,000 New York state troops, stationed in the area to assist with border disturbances. Among the troops was Russian-born, Yiddish-speaking, 19-year-old Samson Z. Abelow. By 1930 Abelow, now with a wife and two young sons, was still enlisted and stationed at Fort Brown, outside of Brownsville in neighboring Cameron County. The presence of so many soldiers helped McAllen’s population to grow from 1,200 in 1916 to 6,000 in 1920. With the growth of industry and the construction of a small number of factories in town, McAllen’s population continued rising to 9,074 by 1930 and 11,877 in 1940. Part of McAllen’s population influx of the 1920s and 1930s were many of the Jews who would in coming years found synagogues in both Mercedes and McAllen. As they arrived in McAllen and the surrounding towns, Jews, many of whom were immigrants, opened various businesses. On their way to McAllen in the early 1920s, Esther and H.I. Schlader instead settled in nearby Edinburg where H.I., a Lithuanian immigrant, opened a dry goods business and later became a banker. Other Jewish dry goods merchants of the 1920s and 1930s near McAllen include Russian native and World War I veteran Albert Chaleff, Joe Goldberg of Poland, who moved to Pharr in 1937 with his wife Anna, and Joe Melcher who arrived in the area in 1925. Jews also found success with clothing, produce, and furniture businesses. One successful furniture merchant was Sam Lack, who after starting Lacks Tire & Supply in 1935 in downtown McAllen, later opened a chain of furniture stores throughout the Rio Grande Valley. Lack served two terms as president of Temple Emanuel and was a founder and president of the local B’nai B’rith lodge. He was extremely active in McAllen civic life, serving as president or board member of several local organizations, including the McAllen Civic Center Board, the Citizens League, the Salvation Army, the Rio Grande Cancer Treatment Center, and the First National Bank of McAllen. In 1955, McAllen’s Chamber of Commerce chose him as the city’s first “Outstanding Man of the Year.” A strong supporter of Israel, Lack, along with produce merchant Max Lutz, convinced two McAllen banks to buy State of Israel bonds, making them the first banks anywhere to do so. Due to community leaders like Lack, McAllen’s newfound Jewish population did not remain unorganized for long. In the early 20th century, more Jews lived in Mercedes or Pharr than McAllen and a congregation had existed in Mercedes, 20 miles away, since 1928. With the help of Sam and Bea Lack and Jacob and Sophye Edelstein, a synagogue, Temple Beth Israel, was built in Mercedes in 1936. 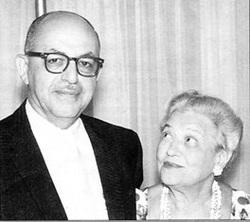 Other Jews from McAllen joined Temple Beth Israel, including Louis Herman, the Chaleff family, Joe Goldberg, Elizabeth and Irving Kunik, and Moe Adams, who served as synagogue vice president. 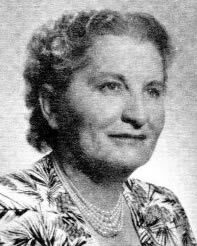 Around the 1930s, Sophye Edelstein started a Sunday School in McAllen which met in various homes. Other Jewish organizations soon arose in McAllen, including a Readers Club, formed in 1941, and a chapter of the Council of Jewish Women, organized in 1943. The Sunday school in McAllen marked the beginning of the growth of organized Judaism within the city. With the construction of the McAllen-Hidalgo-Reynosa International Bridge in 1941, tourism to McAllen increased and, with the rise of the oil industry and other economic developments in the area, McAllen’s population soared in 1940s. The Jewish population increased as well. Thus, in the late 1940s, 28 families met in the home of Rachael and Charles Wolff in Pharr and decided to form a congregation and build a synagogue of their own in McAllen. Integral to the planning of the new temple were Sam Lack and his good friend Adolph Westerman, who led the fundraising and oversaw the construction for the new synagogue, which began in 1948. Westerman became Temple Emanuel’s first president, with Lack as his vice president and eventual successor. With many of its members now affiliated with the McAllen congregation, Temple Beth Israel in Mercedes decided to close, with its assets, both physical and financial, being split between Temple Emanuel and a new congregation that was formed in Harlingen. On March 20, 1949, the new synagogue in McAllen was dedicated in a ceremony officiated by Rabbi Yonah Geller of Temple B’nai Israel and Sidney Wolf of Temple Beth El, both of Corpus Christi, and featuring speeches from Reverend Francis Cheney of McAllen’s St. John’s Episcopal Church, Reverend Hearne Spruce of the local Ministerial Alliance, and Louis Herman, Temple Emanuel’s lay religious leader. Though Temple Emanuel was Reform in practice from its inception, it was not until 1954 that the congregation formally affiliated with the Union of American Hebrew Congregations. That year, the congregation had 55 families. Louis Herman died in 1949 and a rotation of lay leaders served the congregation until 1956, when the temple’s first rabbi, H.B. Gordon, was hired. In 1951, jeweler Moe Adams, who had been instrumental in finding a plot of land for the temple and raising funds for its construction, chose land for a Jewish cemetery, which he maintained for 45 years. Mary Westerman helped establish a Sisterhood five months before the dedication of the synagogue. A few years later, she organized a local Hadassah chapter. Alongside the Council of Jewish Women, the Sisterhood worked with the United Jewish Appeal to accept a refugee family from a German displaced persons camp. Following World War II, McAllen’s Jewish community also cared for Arnold and Rebecca Spanner, a Polish couple who were both Auschwitz survivors. Upon its 50th anniversary in 1998, Temple Emanuel reported a membership of 180 families, corresponding to the huge burst in McAllen’s population from 32,728 in 1960 to 106,414 in 2000. The passing of the North American American Free Trade Agreement in 1993 has helped to bring increased economic activity to the area. Unlike many other small congregations in Texas, Emanuel has been able to retain a number of the children raised in the congregation who have chosen to return to McAllen rather than moving to a larger city. In 1998 the legacy of Emanuel’s earliest families was still in full force-- three generations of Westermans and Kuniks attended Emanuel and at least one grown child from the Lack, Moritz, and Klein families also still lived in McAllen. Though the number of families had fallen to 136 in 2011, Temple Emanuel maintains a strong presence in McAllen today under the leadership. In 2008, the congregation dedicated a new synagogue, fittingly located on North Chai “C” Street. For its comparative youth, Temple Emanuel has found resounding success in a seemingly remote location over the last 60 years.